Studying Sha’ul has been a real challenge for me. He seems to say that Torah needs to be followed one moment and then tells the gentiles not to become Jewish and not to undergo circumcision. I am starting to wonder whether he was schizophrenic? How do you understand him? It is my understanding that circumcision is necessary to become partaker of God’s covenant with Abraham. I quickly wrote the article below in several hours in answer to John’s question. The article probably contains some typos. If so, let me know in this article’s comments section. No matter how many times I read my articles, I still find typos, so your help will be appreciated. For those of you who have my cell phone number, don’t text me with your typo notices. Email them to me, please. It’s a lot easier for me to make the corrections from my computer than my cell phone. Thank you. And account that the longsuffering of our YHVH is salvation; even as our beloved brother Paul also according to the wisdom given unto him hath written unto you; As also in all his epistles, speaking in them of these things; in which are some things hard to be understood, which they that are unlearned and unstable wrest, as they do also the other scriptures, unto their own destruction. Ye therefore, beloved, seeing ye know these things before, beware lest ye also, being led away with the error of the wicked, fall from your own stedfastness. Again, if Paul was hard to understand in his day, how much more 2000 years later! For those living and working with Paul, he was hard to understand because of his intellect and education. He was one of the top Jewish scholars of his day with an intellect to match it. You weren’t taught by Gamliel, the grandson of Hillel the Great, the founder of the Hillel School of Phariseeism and considered by some modern Jews to be the greatest sage of the common era, unless you were the top of your class in Jewry! This was the same Paul who was well-travelled, multi-lingual, could debate with the Greek philosophers of Athens, could quote Greek literature from memory and was from a wealthy and prominent family who were Roman citizens because of their wealth and influence. By contrast, most of Yeshua’s other disciples were from the backwoods regions of the Galilee and were common tradesman. Today it would analogous to a logger from Oregon or a fur trapper from Alaska suddenly linking up into a working relationship with a PhD professor in physics or philosophy from Oxford or Cambridge. That was Paul compared to the other apostles. Now scroll forward 2000 years. Since then, we have nearly 2000 years of church history with all of its institutionalized traditions, syncretistic belief systems, man-made doctrines, anti-Semitic theologies and so on to have to wade through. The very purveyors of these church traditions are also the same people (the Christian leaders and “scholars”) who are translating our Bibles. This means that they’ll often be translating the biblical text in ways that agree with their best (often anti-Torah) understandings of Scripture. It is this Babylonian mixture of truth and error (man made doctrines and traditions of men along with questionable if not faulty Bible translations) out of which most of us have come. We have to somehow weave our way through this tangled religious theological mess and figure out what is truth and what is error, what to keep and what to toss out, who is right and who is wrong, what is wheat and what is chaff. This isn’t easy to do when we’ve been brainwashed to view Paul, the Torah-law and the rest of the Bible in a certain way through the lenses of those who have taught us their viewpoints be they right or wrong. This endeavor on our part to separate the precious from the vile, the holy from the polluted promises, justifiably so, to be a daunting and frightening proposition for most people. That’s why the majority of people will prefer to stay in the comfort zones of their churches and man made traditions, rather than to step out into the unknown and unexplored wilderness of being a truth seeker, and, like a modern-day archeologist, to dig down to the bedrock of biblical truth. To step out of the boat of the church system means that, like Peter, you have to have a higher measure of faith than those who will remain comfortably in the boat of their religious traditions. It means that one has to keep their eyes on Yeshua and follow his voice, or else sink into the spiritual watery depths of spiritual confusion. It means that you have to role up your sleeves and get to work, and put on your rubber muck boots and slog through the muddy dung in the barnyard of men’s religion to get to the solid high ground of biblical Truth. Now let’s discuss Paul specifically to unlock the mystery of how to understand him. This is not a complicated task if done in a logical way. The way NOT to do it is to cherry pick Paul’s difficult-to-understand scriptural passages out of the larger contest of Scripture and then to explain them one-by-one. This becomes an impossible knot to untie—especially in light of how many Christian scholars have translated his hard sayings through the grid of their faulty understanding and biases. Rather, the best way to understand Paul is to step back and to view his writings from his larger context of Scripture—the forest for the trees. For example, Paul told the saints in Corinth to imitate him as he imitated Messiah Yeshua (1 Cor 11:1). By the way, this lines up with John’s instructions to all the saints in his first general epistle (1 John 2:6). If we’re to imitate Yeshua, then what did he do, so that we can imitate him as Paul (and John) instructs? For sure Yeshua followed the Torah-law. If not, he was a sinner, for we read in Scripture that “sin is the violation of the Torah-law” (1 John 3:4), that sin is unrighteousness (1 John 5:17) and that YHVH’s Torah-law defines what righteousness is (Ps 119:172). On the contrary, we know that Yeshua kept the Torah, for he was without sin, for if he had sinned, he wouldn’t been our perfect, sin-free Savior or Redeemer. He kept the Torah in all points and never violated a single command, which would have been sin (Heb 4:15; 2 Cor 5:21; 1 Pet 2:22; 1 John 3:5). Not only did Yeshua obey the Torah, but he clearly upheld its validity again and again (e.g. Matt 5:17–21; John 14:15), and he commissioned his disciples to carry his instructions in this regard forward to the whole earth (Matt 28:20, 18–20 for context). So according to Paul, this is what he imitated, and what he expected the saints of his day (and us) to imitate. Next, we read in numerous places that Paul spoke favorably of the Torah law. The antipathy of humans (even many Christian including scholars, Bible teachers and pastors) toward YHVH’s Torah-law can also be explained by the fact that man has this peculiar tendency to want to twist the word of Elohim to make him say what he’s not really saying at all. The religious Jews of Yeshua’s day had this same (sinful) tendency. Why do men twist the Word of Elohim and make it say something that it doesn’t say? This is because of the innate sinful and rebellious nature of man’s heart as noted just above. This disposition of man all stems from the lie of the serpent at the tree of knowledge, who placed in the mind of man the seeds of doubt and unbelief when it came to obeying the clear commands of Elohim. Now the serpent was more cunning than any beast of the field which YHVH Elohim had made. And he said to the woman, “Has Elohim indeed said, ‘You shall not eat of every tree of the garden’?” (Gen 3:1). Note what the serpent-devil said to the first humans, which caused them to sin: “Has Elohim indeed said…?” In other words, “Does Elohim really mean what he says?” There you have it. The seeds of rebellion, sin, doubt and unbelief! The serpent was really say, “When Elohim gives us commandments to follow, he really doesn’t mean what he says.” All of the ancient church traditions not withstanding, all of the religious institutions, the seminaries, the denominations, the church buildings and cathedrals, the religious ceremonies, rituals, pomp, doctrinal statements, creeds, and the religious theological philosophies aside, this lie of the devil is at the basis of all of man’s anti-Torah-law, religious tradition, philosophy, doctrines and rhetoric. And long ago YHVH’s holy prophets who were speaking for him prophesied that this rejection of his Torah on the part of his people would be to occurring down through the ages. So if the church has twisted the truth about what Paul was saying as we’ve just discussed above, what was Paul really saying about the Torah-law? If Pal, contrary to popular and majority opinion, again for the reasons noted above, is really upholding the Torah-law, then what’s going on with him? Simply this. Paul IS NOT against the Torah, but against the false and unbiblical false teaching that man’s good works (i.e. Torah obedience) can earn a person salvation, or that adherence to men’s unbiblical traditions (e.g. that you have to be circumcised in order to be saved) are a necessary prerequisites to obtaining YHVH’s grace or unmerited favor (or pardon for sin). That’s it. This is Paul’s whole thesis and the basis for all of his brilliant and hard to understand polemic is all about. Nothing more or less. When all of Paul’s writings are understood through this grid, he makes perfect sense. He’s totally upholding Torah-law obedience, but not as a precondition for receiving initial salvation or right-standing with Elohim. Salvation occurs through faith in Yeshua and through legally identifying with his death, burial and resurrection. Once that spiritual legal transaction has been made in a person’s life, then Paul expects a person to produce the good spiritual fruits or good works of righteousness that obeying YHVH’s Torah commands bring. For by grace you have been saved through faith, and that not of yourselves; it is the gift of Elohim, not of works, lest anyone should boast. So in light of this truth, some of Paul’s other statements make more sense, as do those of the other apostles and of Yeshua. 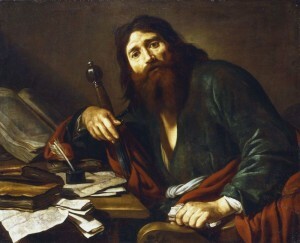 Instead of hearing what Paul is actually saying about the Torah, most people, including Bible teachers, popes, cardinals, bishops, priests, reverends, professors, pastors, Bible teachers, lay people et al have listened to and believe his false accusers, who said that he was violating the Torah and teaching against it. What we see in this passage is two things. First, Paul was not teaching against the Torah, but rather was zealous for it and was teaching the Gentiles the same thing. Second, what Paul was against was the Jewish fable and lie that circumcision was a prerequisite for salvation. It never has been and never will be from Abraham until now. Paul makes this argument in Romans chapter four where he teaches that Abraham was justified by faith in Elohim, not by being circumcised. This is why Paul was ambivalent about the ritual of physical of circumcision. It was a good thing to do, but not a requirement for salvation. When we understand Paul in this contextual light, suddenly he makes sense, and his words aren’t so difficult to understand. The theological knots that religious people have twisted the writings of Paul into suddenly g\begin to unravel. For those who hate the Torah-laws or commandments of Elohim, and prefer instead to believe the lies of the serpent at the tree of knowledge that Elohim doesn’t really mean what he says in his Word, what I have written above will make no sense. In fact they will be opposed to it. They, as Yeshua said, prefer the traditions of men over the word of Elohim, and there’s nothing more I can say to these blind folks except to quote Yeshua who quoted Isaiah. With regard to understanding Paul’s difficult words, I have written several articles on this subject at https://www.hoshanarabbah.org/teaching.html#paul. I have also made numerous videos on the subject at: https://www.youtube.com/user/HoshanaRabbah/videos. This entry was posted in Scripture and tagged Paul, The Law, the Law of Moses, The Torah by Natan Lawrence. Bookmark the permalink.